JavaHead is like a day at Tröegs; it’s hard to tell where the coffee ends and the beer begins. This creamy oatmeal stout is infused with locally roasted, cold steeped coffee through our HopBack vessel, releasing subtle hints of cocoa, roasted nuts and dark mocha. Pour - on the pour you can see it is quiet thin as it leaves the bottle and heads into the glass. Looks like a cola in the glass. 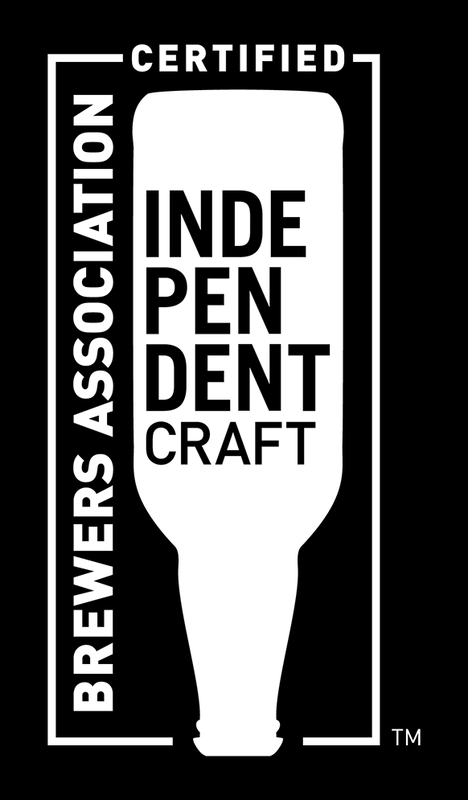 Thin head off the pour which dissipates and hangs around the edge of the glass. Taste - Chocolate right off the bat with some bitterness to it. Coffee isn't that strong and doesn't pick up much at all until the tail end. Some fruits in there in between. Feel - Thin, at least a good bit thinner than I like my stouts. It is smooth but almost has a bit of a watery feel to it. Overall - Decent but not something I'd seek out. Mouthfeel and thinness really aren't there for me. I'd like a stronger coffee presence as well. Served in a pint glass from the bottle. Appearance: Thin super dark brown with heavy bubbles to the body. Head rose to maybe one finger's length dropping quick with easy lacing but still sticky. Smell: Light mocha scent, and believe it or not like a spoon full of fresh coffee. Comes off what bland but still super attending scent. Taste: Bitter coffee, malts are pretty heavy with smooth bitterness. I love the Chocolate finish at the end...like a bitter nutella. Mouth: Medium to heavy carbonation and average stickiness. Overall: Good brew, definitely one of those diamonds in the rough which took me a bit by surprise. Hopefully you like it as much as me, Salud! Pours dark maroon, almost black with a creamy frothy khaki colored foam head. Smells like roasted malts, dark chocolate, oats, vanilla, dark coffee, caramel, charred brown sugar, nutty molasses, mild dark fruits, with herbal earthy grass and woody pine. Tastes like roasted malts, bitter dark chocolate, oats, dark coffee, some dark fruits, dark caramel, nutty molasses, charred brown sugar, with herbal earthy grass and woody pine. Feels medium-light bodied, slick and creamy with moderate low carbonation. Overall a nice coffee oatmeal stout. L: Pours near black with tinges of dark brown around the edges. Ample creamy head with very good head retention. S: Musky, chocolaty coffee with some caramel malt. Some dry oxidized notes with some mild grassy hops. T: Black coffee with some bittersweet chocolate and very minor caramel. Far drier than most stouts of this strength and style, with some bread crust-like malt. F: Medium-body, slightly silky mouthfeel with very moderate carbonation. Thoughts: Halfway decent coffee stout. It would probably be better with some brighter coffee flavors and a touch more malt, but it's pretty decent as is. Appearance: Black-typically stout....great head. Sticky lacing. Aroma: Hops overlaid with roasted malt. Strong doses of licorice and maybe something like cardamom. Flavor: chocolate cake, licorice appears in flavor too as it warms a little. Some oxidized roasted malt on along with hoppy finish. Mouthfeel: clean finish. No cloying. I’ve always enjoyed this non-traditional stout but it’s not off style. It’s available year-round but tasty when weather gets cold. Looks great with a nice head. has a nice thick feel of a good quality stout however it was too bitter considering the coffee flavor and aroma was missing or just overpowered by the hops. I would never turn one down however it would not be a beer I will return to on my own accord. 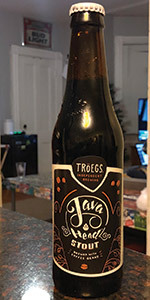 Tröegs Java Head Stout has a medium-to-thick beige head, a dark brown appearance, with reddish-brown, as the sunlight hits the edges, and moderate lacing left behind. The aroma is of dark malt, roasted coffee, some rich chocolate, and, perhaps, oats. Taste is of all that, with an acrid, but not unpleasant bitterness. Mouthfeel is medium to heavy, and Java Head finishes medium dry. malt, char, and hop finish. Overall this is a solid offering from a great brewer. Pours an opague black with an extremley creamy coffee colored heading. Stays thick and creamy until the very last sip. Smell is heavy in roasted malt.Slight cocoa aroma with a decent amount of coffee bean as well. Taste is mostly roasted malts at first wave. The second wave I let dance on the palate while. There is a nicely blended coffee bean and citrusy hop taste to this. Maybe a little odd for the style(citrus hops) but does seem to play well here. Mouth has a very nice full bodied feel. Super smooth and velvety. Drink is good. A different tasting stout to me with that heavier citrus and coffee ending. Very drinkable and very crafty. A: Pours a thin brown black with little tan head that fades quickly and leaves a slight lacing. S: Faint smells of chocolate, coffee and roasted malts. Not a very strong smell a coffee flavored stout. T: Stong tastes of coffee beans and semisweet chocolate right off the bat. The flavor fads away and leaves a nice bitterish aftertaste. M: Pretty thin beer. I was hoping for a little more chew from a stout, so I was a little disapointed. D: It's a drinkable beer. Pretty easy drinking for a stout. Not amazing but definitly drinkable. Overall: Overall the beer was decent. Not much smell or chew, but the flavor was decent. It delivers on the coffee taste that it advertises. There are definitly better stouts out there, but this is worth a try for any coffee flavored stout lovers. Look: Poured into a snifter. As dark as the darkest stouts I've seen. About one finger of light tan, which turns into a ring around the edge of the glass. Smell: Very sweet, sugary almost. Like a sweet oatmeal,blended chocolate and coffee. Very good smell. Taste: Mmmm, like a dark chocolate coffee served black, no creme or sugar. The light sweetness from the dark chocolate flavor, and the bitterness of the coffee blend very well. Mouthfeel: Medium to full bodied. Pretty creamy. Not too little, not too much. Just right. Overall: This has been my go-to favorite from Troegs. Last I was at their brewpub this is what I had. As well being a coffee type stout, which I love. Good stuff. Poured from 22oz brown bomber into a clear glass snifter. Bottled on date on neck. Purchased at Wine Warehouse (Charlottesville, VA) for $5.49. A: Beautiful black with 2-finger light brown bubbly head with good retention and spots of lace around the glass. S: Strange orange blossom dominated aroma with additional dark, chocolate and toasted malts and soft floral, pine hops note. The java component is pretty bitter but overwhelmed by the orange creme smell. T: The flavor is also very strong of the creamy orange citrus with comparably strong, bitter java and dark malt notes. This is still strange for an oatmeal stout -- hops are generally low and flavors aside from coffee and toasted malts are uncommon. M: Smooth and easy to drink, although the body is a bit thinner than expected. Carbonation is low and the aftertaste is bitter coffee and orange peel. D: A very odd brew with heavy citrus contributions and less pronounced coffee notes. Not Troegs' best by any means.